Twitter might give you access to advanced Tweetdeck tools for $20 a month. Twitter has always been free to use and will likely remain free. But the company is now considering offering its first paid subscription service through Tweetdeck. The social network has recently sent emails to select users, asking if they'd be willing to pay for a "more advanced Tweetdeck experience." Based on the email posted by journalist Andrew Tavani, a premium experience will add new viewing, posting and signaling tools in one customizable dashboard that you can see above. They include bookmarks, to-do lists, a "save for later" option, cross-posting capabilities, the ability to manage multiple accounts and to customize tweets for different groups of followers. The ad-free premium tier will also come with analytic tools and be available on mobile and desktop. Since these features obviously target social media professionals and companies, it's unclear if the company will offer the option even to casual users. What we do know is that you'll have to pay a monthly subscription fee to access these tools, and it might cost you $20 per month. Twitter will likely have to offer everyone the chance to subscribe if it's depending on the tier to make money for the company, though: It missed Wall Street's revenue estimates for Q4 2016 and its ad business isn't doing so well either. "We're conducting this survey to assess the interest in a new, more enhanced version of Tweetdeck. 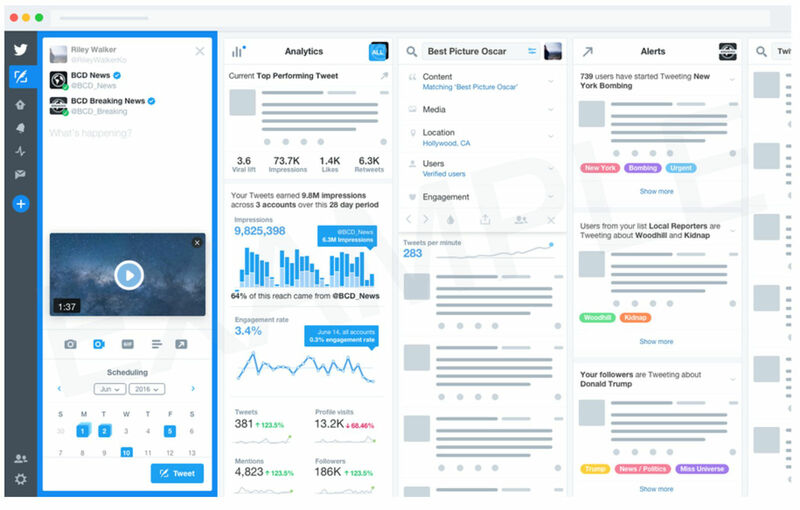 We regularly conduct user research to gather feedback about people's Twitter experience and to better inform our product investment decisions, and we're exploring several ways to make Tweetdeck even more valuable for professionals."